CT Shop (an abbreviation for shop for cosmetic tattooing supplies) is a description of a service provided by 'Andrea Darby' my one stop shop for premium Cosmetic Tattooing / Permanent Makeup / Micro-Pigmentation supplies and other quality products, proudly hosted on my domain CosmeticTattooist.com which is a perfect description of my main service Cosmetic Tattooing! Based in Melbourne Australia Andrea Darby has quickly gained a reputation for providing excellence in Cosmetic Tattooing services and has strived to be at the leading edge of technology for client services, her domain CosmeticTattooist.com has become a leading resource for client information and is the leading site dedicated to Cosmetic Tattooing within Australia,our global education platform CosmeticTattoo.org is one of the most popular industry websites worldwide as ranked by Alexa. 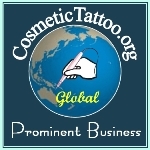 Unlike other sites CosmeticTattooist.com and CosmeticTattoo.org do not pay for search engine and directory rankings the rankings are obtained due to the quality and enormous popularity of site content. • CT-AIVEP© - Accelerated Interactive Vocational Education Platform for Cosmetic Tattooists Training. • Theoretical & Practical Training - The most comprehensive training program for Cosmetic Tattooists available within Australia. • Video Microscopy for student education within our training programs. • The Virtual Pigment Mixer©, see a simplified version in our Colour Selection Guide. • 3DSAT© - 3D Simulative Areola Tattooing. • A new methodology for Cosmetic Tattooing that approaches clinical hygiene standards. • Graduate update bulletins for graduates from our training programs. • The first Cosmetic tattooist In Australia to conduct and publish a comprehensive Comparative Analysis of a digital cosmetic tattoo device compared to a rotary pen. • The first Cosmetic Tattooist in Australia to enter into exclusive partnership with the worlds leading manufacturer of Digital Micropigmentation devices and the introduction of their groundbreaking Amiea range into Australia. • Comprehensive consultation with an Australian PhD Pharmacist to develop Australia's first commercial range of topical Anaesthetics specifically designed for use prior to Cosmetic Tattooing. I am also pleased to provide a Cosmetic Tattooists supplies shop, we are sure you will find some great products.